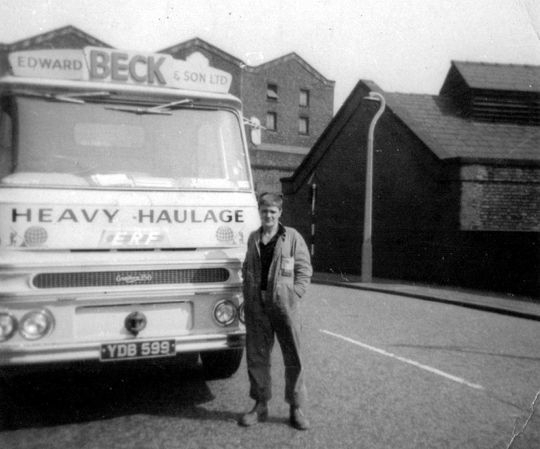 A short colour film, taken in 1960 by Teddy Beck, in the depot of the heavy haulage company of Edward Beck & Son Ltd whose premises were located on Greg Street Reddish Stockport. This particular section of the site below contains images sent in by former employees of Edward Beck & Son Ltd. 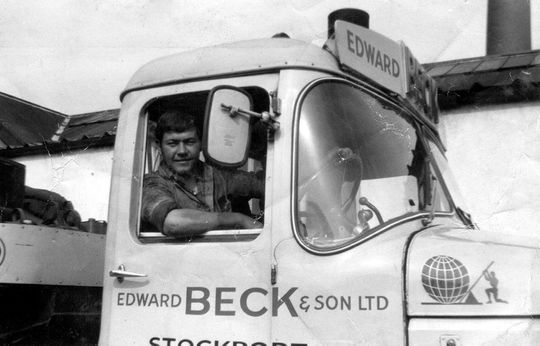 If you ever worked for Edward Beck, or even if you didn't, and have any photographs you would like to add to the site please get in touch via the guestbook page and we will get back to you. Drivers mate Graham Philips takes time out for a photograph in the driving seat of Scammell Highwayman 4X2 tractor unit Reg No WJA 131. Pictured in the depot at Greg Street Stockport WJA 131 was driven at the time by Brian Daniels. 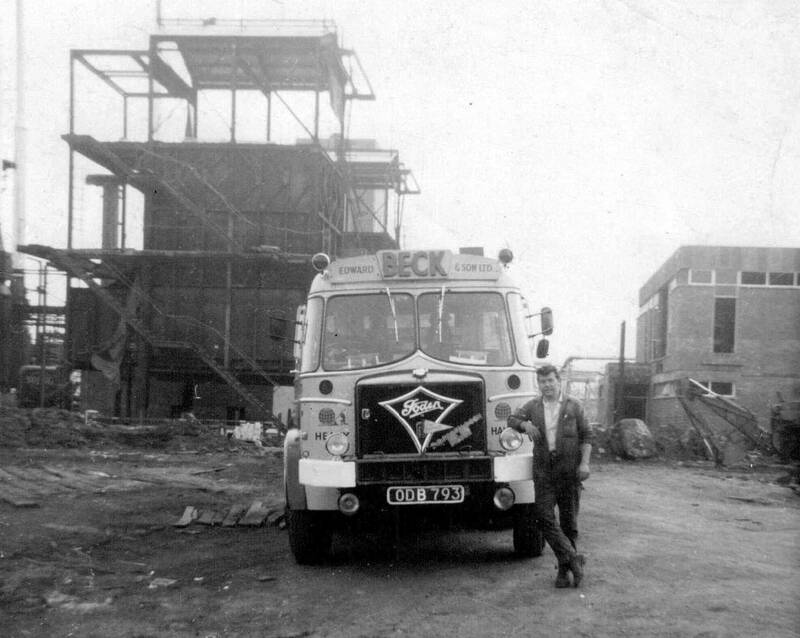 Graham Phillips worked at Beck's along with his twin brother Steve. Note click on any image in this gallery to view full size. 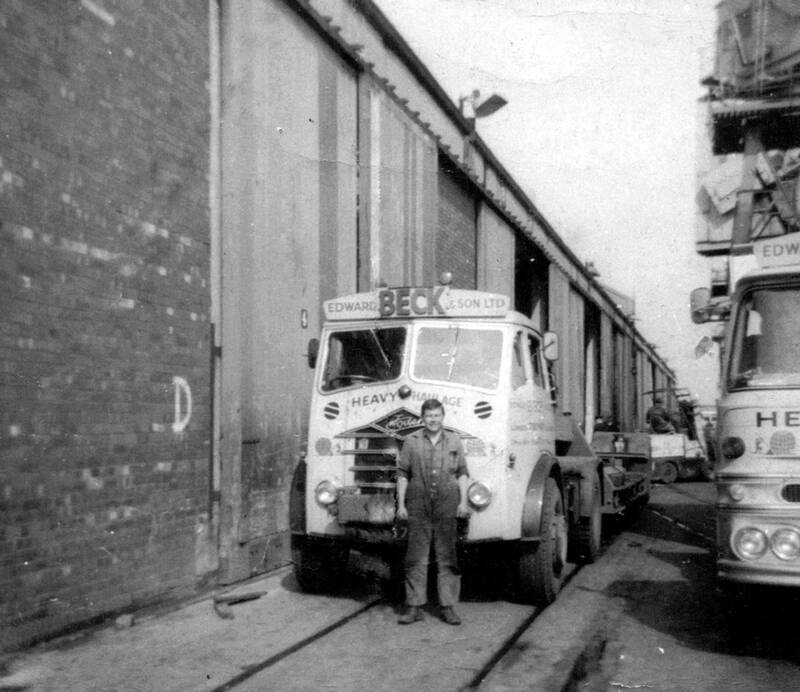 Another shot of Scammell Highwayman 4X2 tractor unit Reg No WJA 131 pictured in the depot while loading up with timber for the next job. From left to right, driver Brian Daniels, mate Graham Phillips and second mate whose name we do not know at this time. 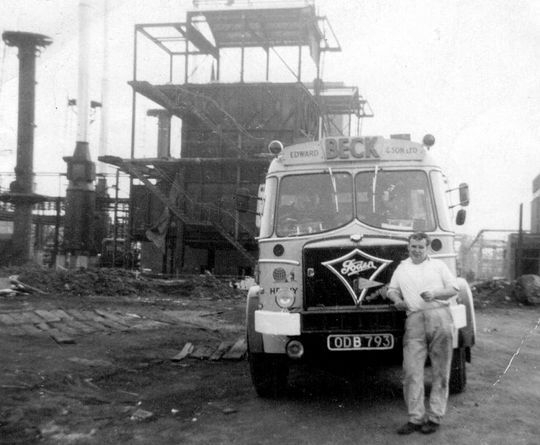 Graham Phillips is pictured standing in front of FG Foden Reg No KDB 703 at Salford Docks while waiting to load up a D8 Caterpillar tractor destined for Cannock in Staffordshire. 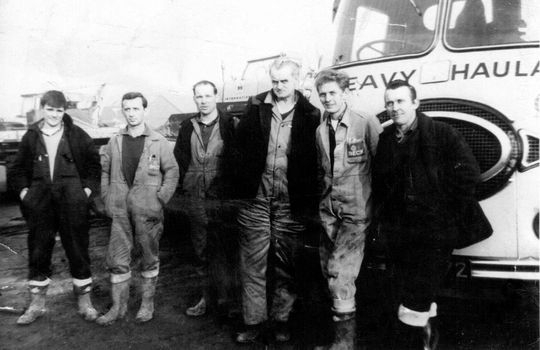 Graham was one of the 'Phillips Twins' whose brother Steve also worked at the company for quite a number of years. Photograph courtesy of Graham Phillips. Drivers mate David Shawcross takes time out for a photograph in front of Boalloy LV Cabbed ERF 64GX heavy duty 4x2 tractor unit Reg No YDB 599 which was powered by a Gardner 150 engine. 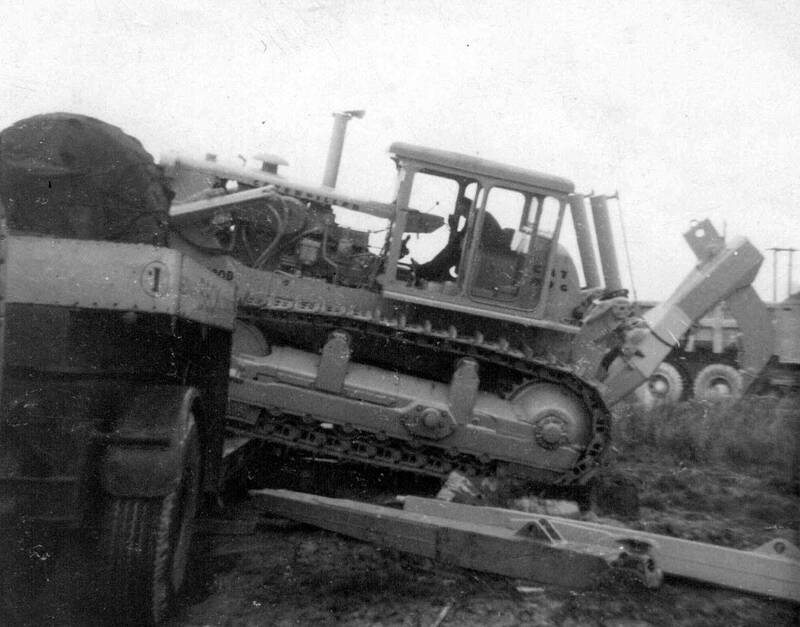 Photograph courtesy of David Shawcross. Rolls Royce powered KV Cabbed ERF 6x4 double drive heavy duty tractor unit Reg No UNE 2 is seen here broke down while hauling a large excavator. 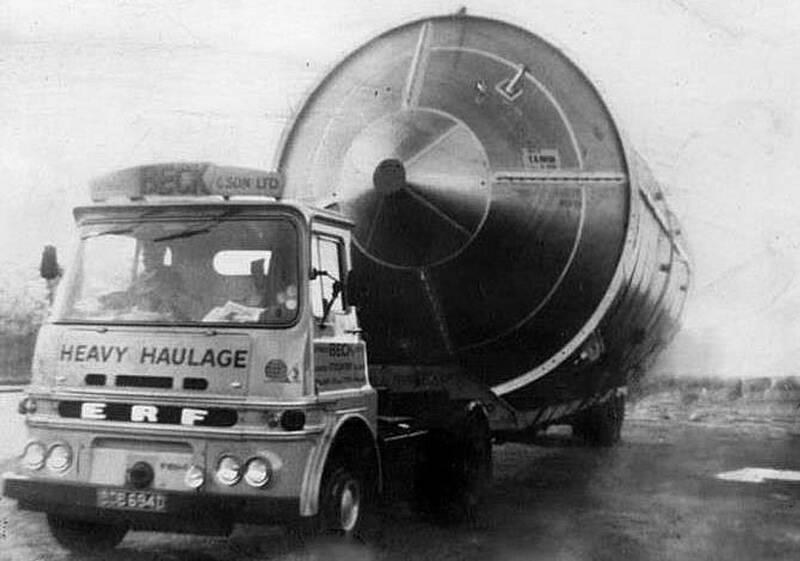 The driver and his mate pass the time away by catching up on some reading while waiting for assistance after KV Cabbed ERF 6x4 double drive heavy duty tractor unit Reg No UNE 2 broke down. Heading down the road again! 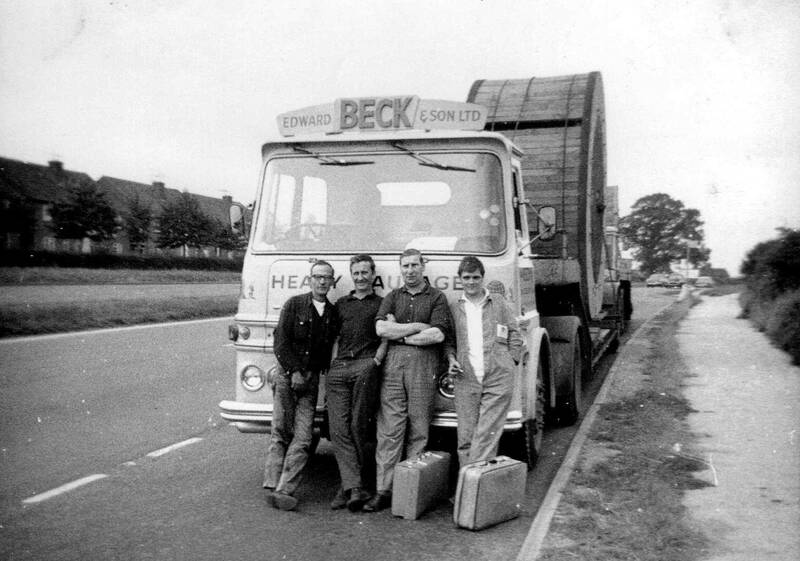 Left to right Jack Sullivan, Brian Daniels, Arthur Duffy and Dave Shawcross have their picture taken in front of a pair of the company's Boalloy LV Cabbed ERF 64GX heavy duty 4x2 tractor unit's which were both loaded with AEI cable drums. 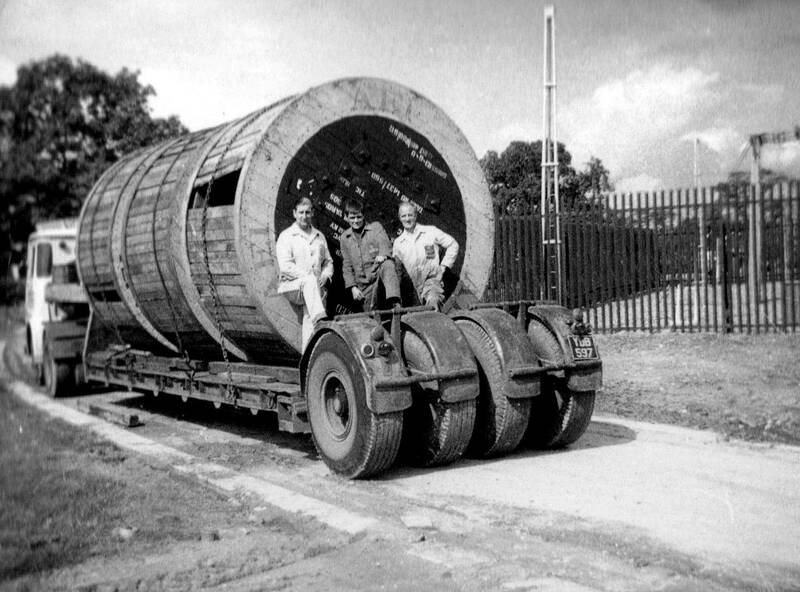 Photograph courtesy of Dave Shawcross. When this picture was taken driver Arthur Duffy was allegedly checking the air lines on LV Cabbed ERF 64GX heavy duty 4x2 tractor unit Reg No YDB 597. 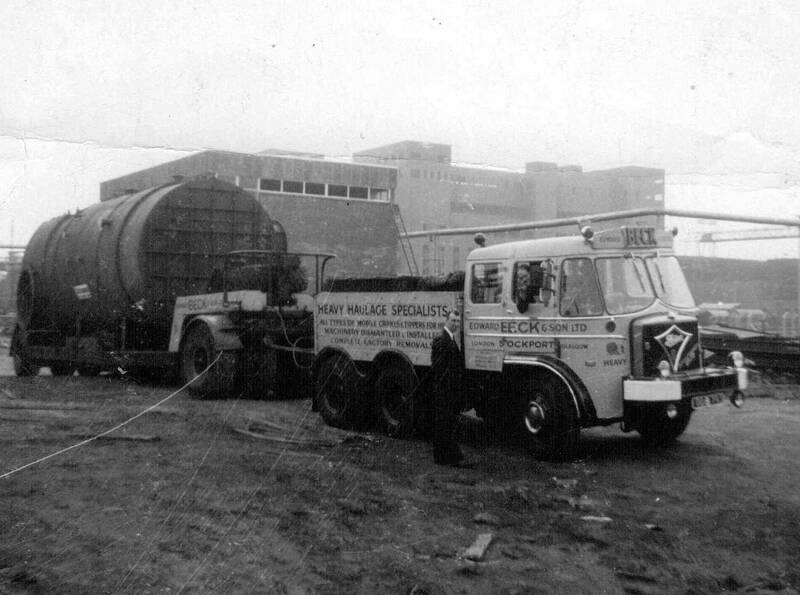 In 1967 there was an outbreak of foot and mouth disease which resulted in the mass slaughter of livestock across the UK. 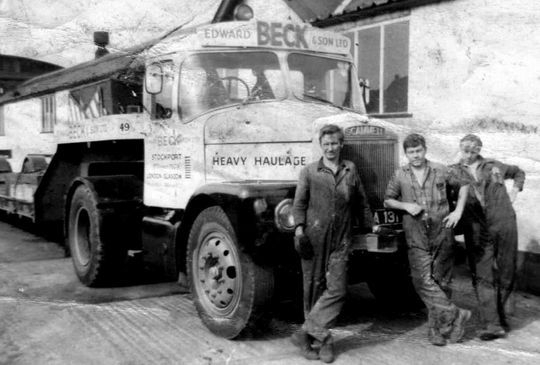 Beck's were called in to transport a huge amount of heavy plant equipment to Winsford in Cheshire which was required in helping to dispose of all the dead animals. Pictured here at Winsford in December 1967 are, from left to right, Dave Shawcross, Eric Etchells, Arthur Fryers, Harry Harrop, Roy Cheetham and Chester. From left to right, Arthur Duffy, name unknown and Colin Howells are pictured here with a load of electric cable drums manufactured at the AEI plant at Gravesend. 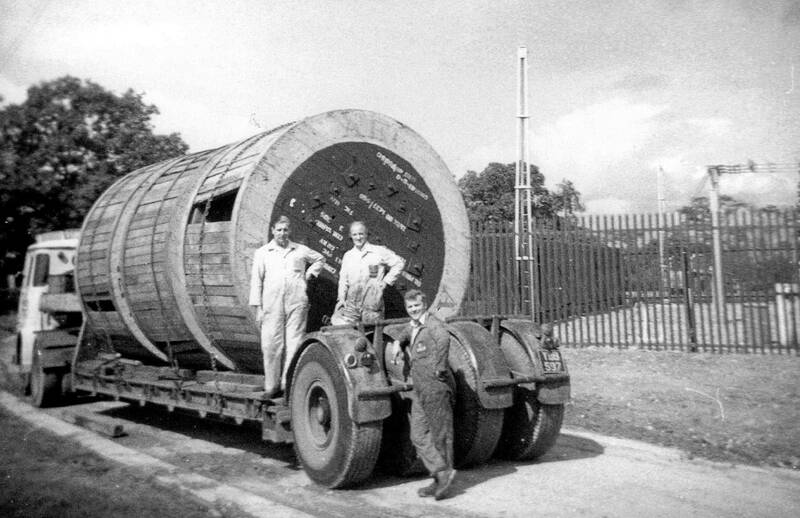 Left to right Arthur Duffy, Dave Shawcross and name not known take time out for a picture on the back of a low-loader with three large drums of AEI electric cable about to be unloaded. 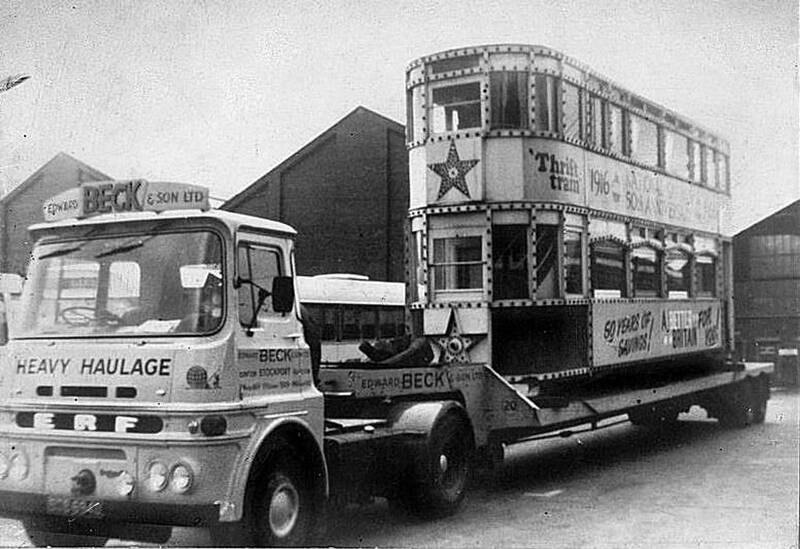 LV Cabbed ERF 4X2 tractor unit Reg No BDB 694D, which was driven by Bob Prince (Snowy), is pictured here in 1966 while transporting Blackpool Tram No 159 which is decked out in lights for the 1966 Blackpool illuminations advertising 50 years of National Savings. After being withdrawn from service Blackpool Tram No 159 underwent restoration and is now operated on a regular basis at the East Anglia Transport Museum, Carlton Colville near Lowestoft Suffolk. 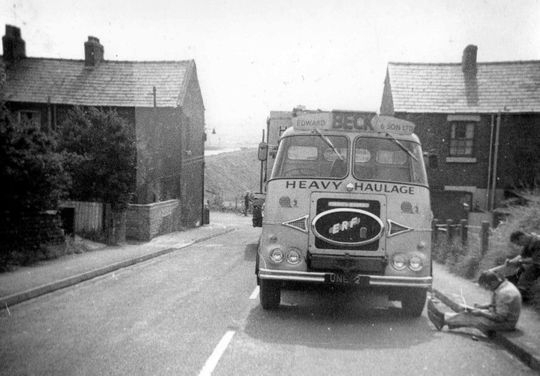 Another picture kindly sent in by Paul Prince, whose father Bob Prince (Snowy) drove for Beck's for many years, again shows LV Cabbed ERF 4X2 tractor unit Reg No BDB 694D this time hauling a a large steel vessel in 1966. 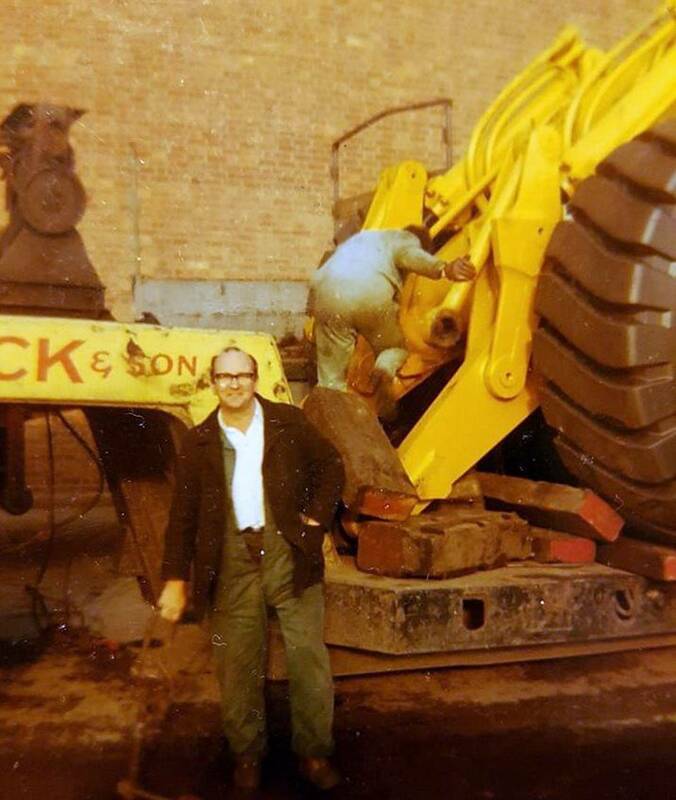 Long time serving Beck's driver Jack Bradshaw takes time out for a photograph at Bowmaker Plant Ltd Cannock during the unloading of a large Caterpillar loading shovel in 1971. Drivers mate/steersman Steve Phillips is pictured here next to Foden S50 ballast tractor Reg No OJA 859H while doing his Bruce Forsyth impression. In 1965 drivers mate/steersman Steve Philips took his camera along with him and took this series of photographs which shows the delivery of a 50 ton steel boiler from Joseph Adamson of Croft Street Hyde to Shotton on Deeside. 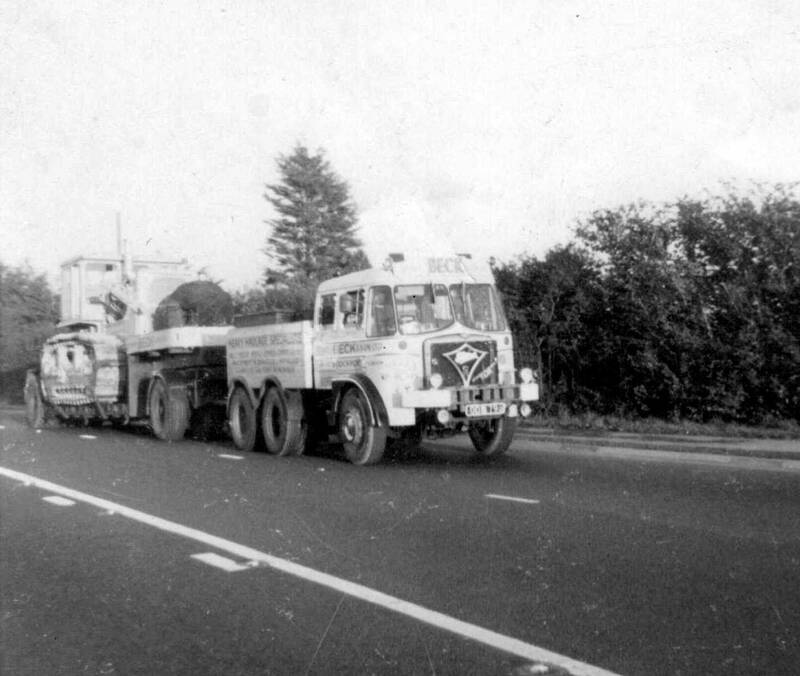 Hauled by the 'Big Bopper' the 50 ton boiler arrives on site at Shotton on Deeside after it's journey from Hyde on the back of a Crane Fruehauf four-in-line low-loader and dolly. Steve Phillips is pictured next to the 50 boiler shortly before unloading begins on site at Shotton. 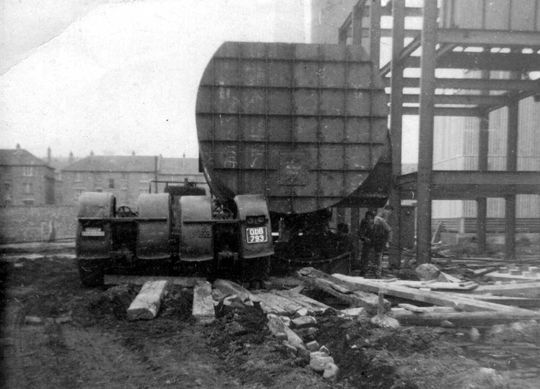 The Machine Gang get to grips with off loading the boiler and place it into position on site with jacks and cables. 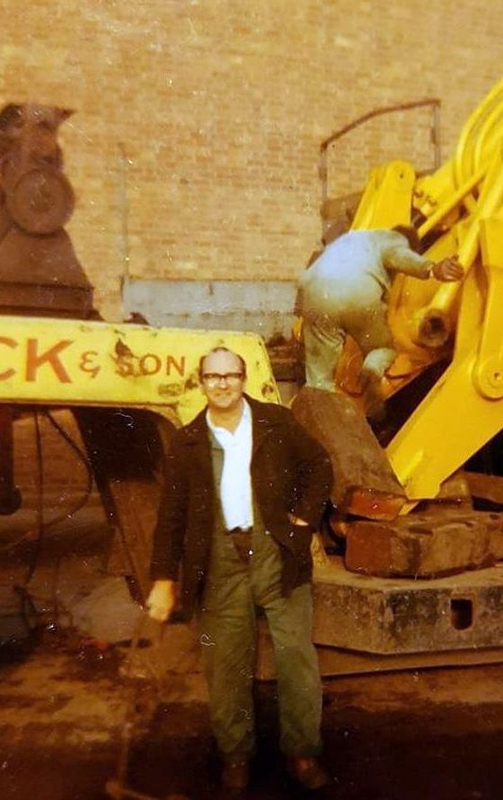 First mate Dave Porter takes time out for a photograph in front of the 'Big Bopper' after the delivery of a 50 ton boiler to Shotton on Deeside. 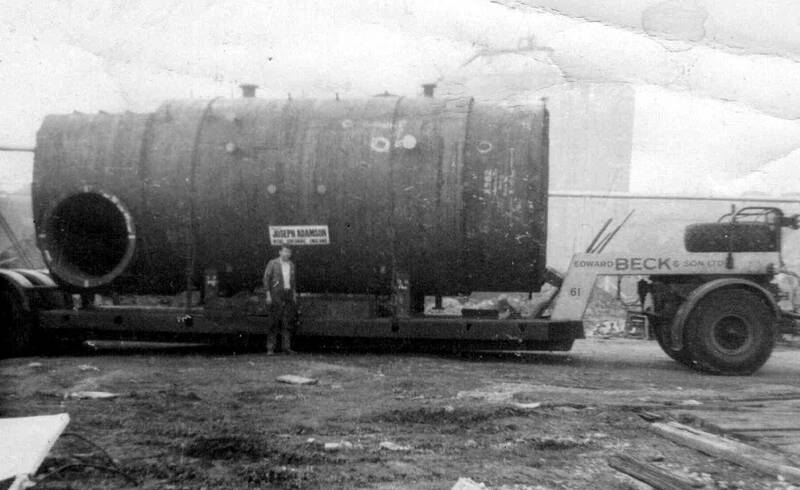 Steve Phillips hands his camera over to Dave Porter and takes his turn to pose in front of the 'Big Bopper' after delivery of the boiler to Shotton on Deeside. All photographs courtesy of Steve Phillips. 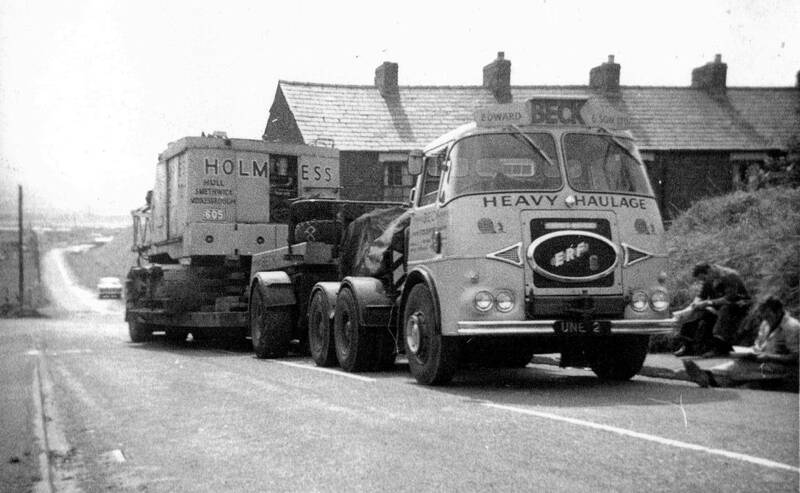 Again in 1965 the 'Big Bopper' Reg No ODB 923 was used to transport a Caterpillar D9 bulldozer from Cannock in Staffordshire down to St Austell in Cornwall, a distance of 258 miles. 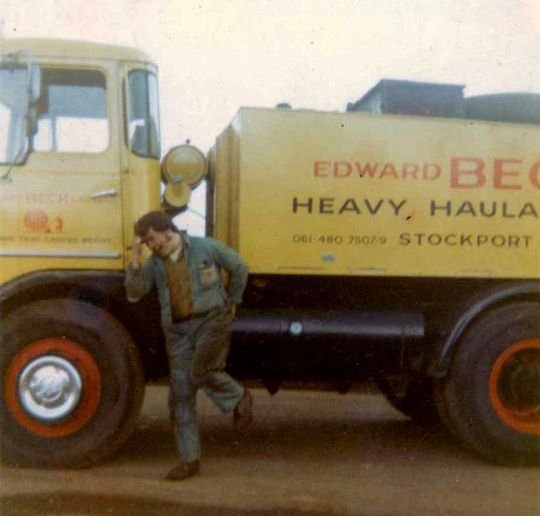 The pictures below were kindly sent in by former drivers mate/steersman Steve Philips. 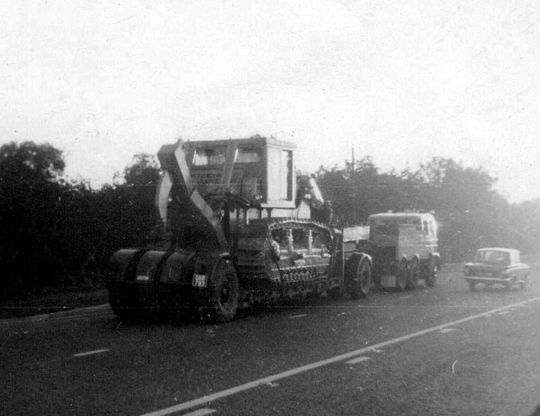 Coupled up to a Dyson four-in-line trailer with a dolly the 'Big Bopper' heads South to St Austell with a Caterpillar D9 bulldozer on board in 1965. 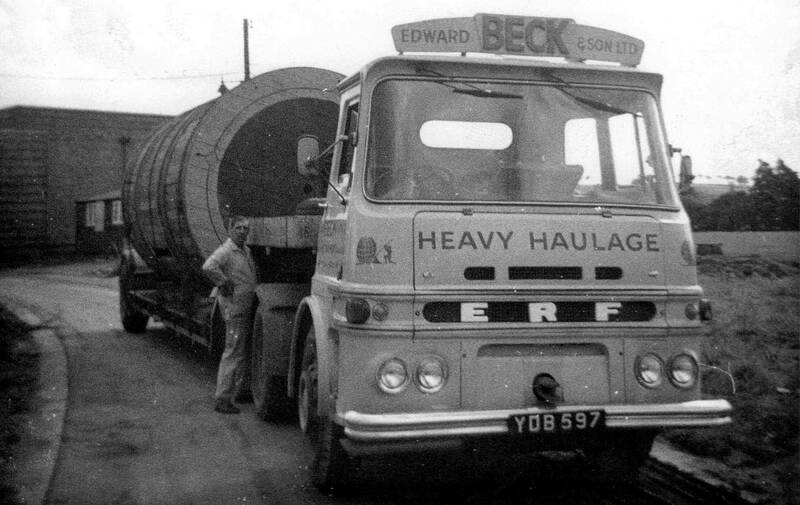 A rear end shot of Beck's Dyson four-in-line trailer with the Caterpillar D9 bulldozer on board as it heads South to St Austell in Cornwall. St Austell Cornwall and after a journey of 258 miles the Caterpillar D9 bulldozer is unloaded at its final destination.